Amazon Price: $689.00 (as of October 18, 2017 8:12 am - Details). Product prices and availability are accurate as of the date/time indicated and are subject to change. Any price and availability information displayed on the Amazon site at the time of purchase will apply to the purchase of this product. This AAA grade, triple-strand freshwater cultured pearl necklace features very round to near round cultured pearls with excellent uniformity, surface and luster. 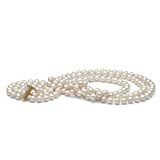 Each cultured pearl is individually knotted on silk, and the strand is finished with a solid 14k clasp. The strands are nested with the inner strand sitting just above the outer strand. The outer strand is 19 inches and the inner strand is approximately 17 inches.